"All of this, I assure you, is a real thing." It takes a special person to be comfortable handling the deceased on a daily basis. Saying nothing about the basic concept of physically handling dead bodies, there's something emotional about it as well that asks a person be somewhat disconnected from life. In Gravetrancers #1 from Black Mask Studio, some mortuary wardens are detaching themselves in a slightly unconventional way. The issue is written by M.L. Miller, illustrated by James Michael Whynot, colored by Dee Cunniffe and lettered by Jim Campbell. Miller starts off the book relatively innocently enough with the introduction of Maribel and Anthony--two siblings seeking to visit their father's grave. Miller's dialogue reinforces the duo as very typical siblings, but as soon as they arrive at Malort Cemetary things slowly begin to unravel for the characters and the reader. The premise in Gravetrancers #1 is actually pretty interesting, as Miller explores the personalities that are the most likely to own a morgue and how interacting with primarily the dead could have an adverse effect on dealing with the living. Where the issue really takes a turn is about halfway through the book when both the reader and the character realize that Miller has nothing but bad in store for the characters. The issue is paced extremely well in this regard as there's a slow and steady build-up to the cliff right before the reader is pushed off. Accompanying Miller's deranged script is Whynot's artwork, illustrated in a way that just feels unnerving. His style is very similar to that of Shaky Kane, except that Whynot relies a lot more on heavy shading and cross-hatching. The seemingly ambiguous approach to the artwork by Whynot bolsters the uneasiness of the characters and the reader, serving as a constant reminder that even when the two siblings are just driving you get the sense things are about to get worse. There's a sequence at the end where hallucinations occur and Whynot ensures they're even more terrifying than the artwork as a whole. Cunniffe's colors are an interesting mix of dark and neon colors, juxtaposing death with life. Gravetrancers #1 is a very intense book that embraces the same terror it's looking to invoke. Maribel and Anthony are getting into something that they're not prepared for and the reader is along for the ride. Miller's script is methodical in its approach, giving the reader everything the need to know to enjoy both the first issue and the series as a whole. Whynot contributes an art style that's equal parts grindhouse and general horror, blending together elements of both with ease. 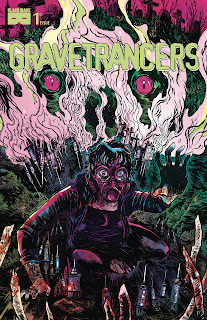 Gravetrancers #1 offers a very dark look at the macabre, delving six-feet under the reader's sense of comfortable before digging even deeper. Gravetrancers #1 is available December 6.